Good stuff. By the way, Paracelsus, who no doubt was pretty smart in his day, was born over six hundred goddamn years ago and the primary observation metrics available to Paracelsus was whether or not something died or not. Sure, oxygen is deadly in sufficient concentrations, as is water, salt, and everything else, so if we want to have a discussion that allows only for endpoints of livingness or death, the parameters laid out by him are good boundaries. However, if we would like our conversations to allow for somewhat more subtle changes associated with environmental exposures, something a dispassionate evaluation of the data dictates, we may need to find ways to have conversations that allow for endpoints other than death, and we will need to acknowledge that we have lots of evidence to suggest that there are inputs other than dose that are occasionally meaningful, no matter how this might affect our ability to take comfort in one study or the other. Even worse, we have actual, real empirical data to suggest there are times when there is an inverse dose relationship. Toluene, a volatile organic compound with a wide range of industrial applications, can exert neurotoxic and immunotoxic effects. However, the effects of toluene exposure on developmental immunotoxicity in the brain have not yet been characterized. To investigate the susceptible window to toluene exposure during development and the effects of fetal and neonatal toluene exposure on the neuroimmune markers, gestational day (GD) 14 pregnant mice, postnatal day (PND) 2 and PND 8 male offspring were exposed to filtered air (control; 0 ppm), or 5 or 50 ppm toluene for 6 h per day for five consecutive days. The neuroimmune markers in the hippocampus of PND 21 were examined using a real-time RT-PCR and immunohistochemical analysis. Mice exposed to 50 ppm toluene on PND 2–6 showed significantly increased levels of nerve growth factor (NGF) and tumor necrosis factor (TNF)- mRNAs. In contrast, NGF and brain-derived neurotrophic factor (BDNF) and proinflammatory cytokines TNF-, CCL3, NF-kB, toll-like receptor (TLR)-4, astrocyte marker glial fibrillary acidic protein (GFAP), and microglia marker ionized calcium binding adapter molecule (Iba)-1 mRNAs were increased significantly in mice exposed to 5 ppm toluene on PND 8–12. These results indicate that low-level toluene exposure during the late postnatal period (PND 8–12) might induce neuroinflammatory mediators via TLR4-dependent NF-?B pathway in the hippocampus of PND 21 male mice. 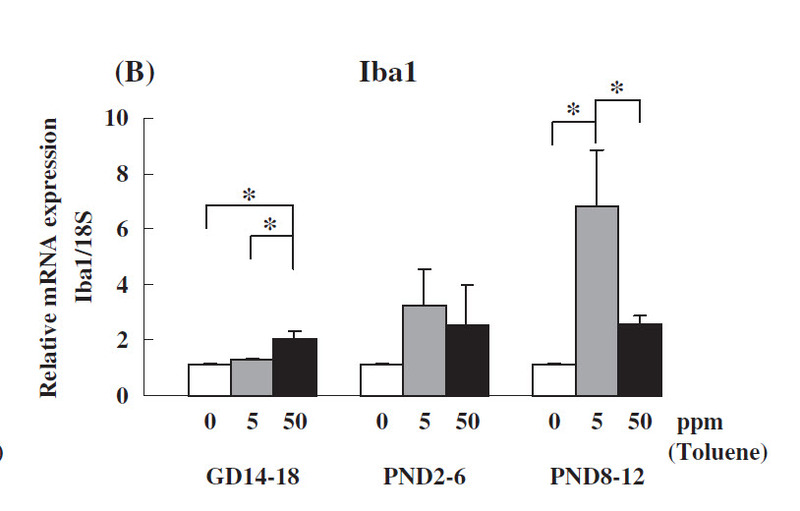 Among the three developmental phases, PND 8–12 seems to be most sensitive to toluene exposure. This is the first study to show developmental phase- and dose-specific changes in neuroimmune markers in infant mice following toluene exposure. Essentially the authors took a bunch of mice exposed them to different amounts of airborne toluene at different days before and after birth, then looked for a variety of changes in immune system markers and neurotrophic factors in the hippocampus. Toluene was certainly capable of tinkering around with lots of systems that we know are skewed in the autism population. Curiously, what they found was that there were time dependent changes that had just as much of an impact than dose of toluene; and in fact, much, much lower doses of toluene were capable of causing more robust changes if the exposure occurred during critical developmental windows. The authors state that the timeframe of exposures in this study, postnatal days 2 -6 and postnatal days 8 – 12 roughly map to the early and late third trimester of human fetal development, respectively. I’ve seen similar equivalencies in other papers, some with earlier and later timeframes, but certainly these timeframes are generally within the range that other papers have used. Consistent with the theme of this post, I’d just say that rat to human is difficult, and rat to human specific brain area and developmental timeframe equivalency is even more difficult. The authors speculate that the difference in effect may be related to what was happening, developmentally within the brain at the time of toluene exposure that made the impact. During this period, hippocampus undergoes an increase in size and a change in excitatory neurotransmission to allow for adult-like synaptic plasticity by the end of the second postnatal week (Dumas, 2005). This transiently heightened level of brain plasticity is shaped byenvironmental factors which have profound effects on this brain growth spurt (Goodlett et al., 1989). Furthermore, during this period, the immune system undergoes maturation to immunocompetence (Dietert et al., 2000). There are also some stuff about why the hippocampus is a particularly promising target for investigation into effects of toluene exposure. Saliently towards autism, these graphs just happen to show some measurements that have great functional overlap with findings from autism. 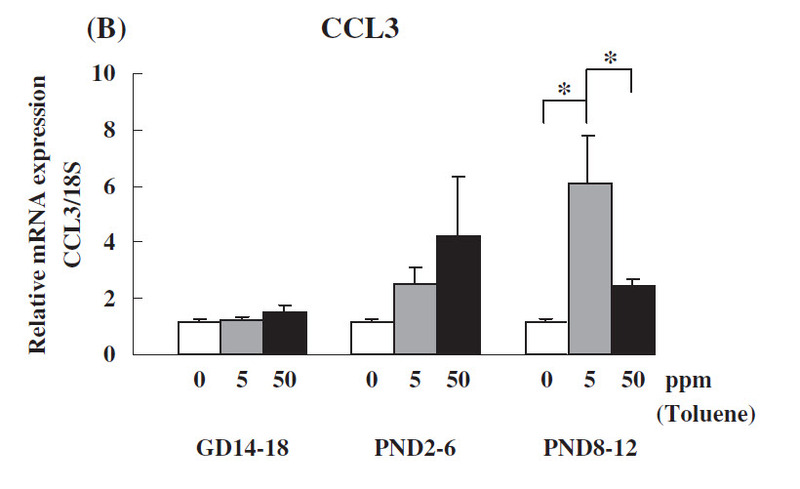 These graphs are for CCL3, an immune bugler of sorts, a chemokine, an agent responsible for attracting components of the immune response, one numeral down for CCL2, aka MCP-1, which we’ve also seen increased in the in autism brains, iba1, a marker for microglial activation, NGF and BDNF, neurotrophic factors that have a variety of signaling and maintenance processes in the CNS, and we have much data implicating altered BDNF levels in autism. Not only did the authors observe an inverted dose relationship, some of the measurements found that the time dependencies are also reversed from what you might expect in that later exposure was worse than earlier exposure. Environmental exposures do not necessarily follow the linear timelines you might expect. Hormesis has been defined as a dose-response relationship in which there is a stimulatory response at low doses, but an inhibitory response at high doses, resulting in a U- or inverted U-shaped dose response. To assess the proportion of studies satisfying criteria for evidence of hormesis, a database was created from published toxicological literature using rigorous a priori entry and evaluative criteria. One percent (195 out of 20,285) of the published articles contained 668 dose-response relationships that met the entry criteria. Subsequent application of evaluative criteria revealed that 245 (37% of 668) dose-response relationships from 86 articles (0.4% of 20,285) satisfied requirements for evidence of hormesis. Quantitative evaluation of false-positive and false-negative responses indicated that the data were not very susceptible to such influences. A complementary analysis of all dose responses assessed by hypothesis testing or distributional analyses, where the units of comparison were treatment doses below the NOAEL, revealed that of 1089 doses below the NOAEL, 213 (19.5%) satisfied statistical significance or distributional data evaluative criteria for hormesis, 869 (80%) did not differ from the control, and 7 (0.6%) displayed evidence of false-positive values. The 32.5-fold (19.5% vs 0.6%) greater occurrence of hormetic responses than a response of similar magnitude in the opposite (negative) direction strongly supports the nonrandom nature of hormetic responses. This study, which provides the first documentation of a data-derived frequency of hormetic responses in the toxicologically oriented literature, indicates that when the study design satisfies a priori criteria (i.e., a well-defined NOAEL, > or = 2 doses below the NOAEL, and the end point measured has the capacity to display either stimulatory or inhibitory responses), hormesis is frequently encountered and is broadly represented according to agent, model, and end point. These findings have broad-based implications for study design, risk assessment methods, and the establishment of optimal drug doses and suggest important evolutionarily adaptive strategies for dose-response relationships. We have other examples from the synthetic world that may be of interest to autism. For example, in Developmental Exposure to Polychlorinated Biphenyls Interferes with Experience-Dependent Dendritic Plasticity and Ryanodine Receptor Expression in Weanling Rats the authors report an inverted dose relationship regarding exposure to PCBs and dendrite growth. Developmental A1254 exposure significantly enhanced dendritic growth in cerebellar Purkinje cells and neocortical pyramidal neurons among P31 rats not trained in the Morris water maze, which is consistent with our previous observations that similar exposures accelerated dendritic growth in Purkinje cells and hippocampal CA1 pyramidal neurons between P21 and P60 (Lein et al. 2007). In Purkinje cells, this effect was observed among animals in the 1 mg but not 6 mg/kg/day A1254 group, whereas in neocortical neurons, responses were comparable between A1254 groups. The reason for the different dose–response relationship in different brain regions is not known. Possibilities include regional differences in RyR regulation (Berridge 2006; De Crescenzo et al. 2006; Hertle and Yeckel 2007) or differential upregulation of cytochrome P450 enzymes by AhR ligands in the cerebellum versus neo-cortex (Iba et al. 2003), which could result in regional differences in PCB toxicodynamics and toxicokinetics, respectively. What about situations where we have evidence for an environmental factors already associated with autism? Neuroinflammation and behavioral abnormalities after neonatal terbutaline treatment in rats: implications for autism found that terbutaline administration at postnatal day 2 -5 resulted in chronically activated microglia and behavioral abnormalities in rodents, but the same dose in days 11 – 14 resulted in no such effect. Same dose, different time, different outcome. There is more, lots more, but how many times must a rule fail primitive logical tests before we acknowledge that it’s utility in complex discussions is extremely limited? This absolutely is not meant as an expose meant to reignite discussions about thimerosal, but rather, to illustrate the dangers of trying to understand complicated rules by leveraging simplistic heuristics. There’s a lot of that in the autism discussion landscape; it is a dangerous concoction of hubris and faith to think that we can have gain meaningful insight into our shared mystery by applying very simple rules. I haven’t seen the ‘poison is in the dose’ canard used for a while now. Good riddance and long live models that are not exceedingly simple to invalidate.